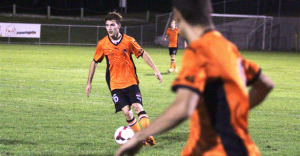 Brisbane Roar NYL were forced to fight back to earn a 1-1 draw against Harimau Muda ‘A’ at Perry Park on Saturday night. Logan Grillo’s 68th minute volley was enough to earn Roar a point in an even affair after Muhammad Ariff Mo Isa gave the visitors an early opener. The young Roar outfit, continuing to rest attacking trio Jai Ingham, Brandon Borrello and Kofi Danning, seemed unsettled by the early pressing of the Malaysians, though they did manage to create a pair of half-openings after 20 minutes through Yandi Munawar and Samuel Sibatuara. Mo Isa and Roar’s Costa Psaros both picked up cautions midway through the first half as the contest evened out into an intriguing tactical battle, with the hosts’ possession-based 4-3-3 short of the attacking cohesion managed by Harimau’s counter-attacking 4-4-2. Though the visitors did begin to retreat and defend in numbers after the break, chances were still created at both ends with Harimau Muda ‘A’ having the first sight of goal via Saarvindran Devandrn’s over-hit cross from a promising area. Roar fired a warning shot shortly after the hour when pacey wing-play from Sibatuara almost brought about a miscued own-goal, and in the 66th minute they were level. Sibatuara was again the instigator as the right-winger managed to get a ball into the penalty area which was deflected high into the air, allowing Psaros time to nod down a layoff which Grillo drove into the bottom far corner with aplomb. The game opened up following the equaliser and both sides almost grabbed the lead shortly after Grillo’s goal as first Mohamad Amirul Awang Kechik volleyed into Chalmers, before Psaros drew a sharp low save from Harimau ‘keeper Mohamad Firdaus Muhamad. Several substitutions followed and suddenly the two young team’s called something of a ceasefire, though a sharper touch from Brisbane substitute Abraham Yango in stoppage time might have meant more. Instead it finished level, a result which at least momentarily keeps Brisbane Roar NYL inside the top four while Harimau Muda ‘A’ will turn their attention to Moreton Bay Jets next weekend.